When we hold onto life experiences, they manifest into something greater until one day we may find ourselves sitting in the trenches of physical limitation. Yoga teachers do not evade this. Most of us come to yoga for the physical healing, just as many of our students do. As we progress, we make peace within our healing process by surrendering, which opens the door to acceptance. This happens when we allow ourselves to share our experiences by being vulnerable. This is much easier said than done. Sometimes teachers do not share physical traumas because we are facilitating a supportive environment and we need to be the backbone for our students. Below, Yoga teacher, Heather Ambrosi, opens up about her journey through her healing process from physical and emotional pain and how she arrived in the seat of patience. Thank you Heather for sharing your beautiful experience. As I come into 2013 I set my intention of patience… Patience with myself, with my husband, with my students, with my path in life. I am honoring patience with myself due to the Hip Surgery I had last summer, my new journey within my body, and how it affects my outer world. I open my soul with honesty and vulnerability with this post and ask you to learn and listen to your body and find the patience when your body longs for it and needs it. The pictures you will see are of my hip socket and the damage found. When I was 14 and cheer-leading, I took a nasty fall while performing at one of our critical basketball games against our rivaling school. I was at the top of our 3 story pyramid, standing on one leg, with my right leg extended. In yoga language, you could say I was in Uthita Hasta Padangusthasana, Extended Hand-to-big-toe pose. My base lost control and I fell 3 levels down with no warning. My right leg was still extended and I landed on my right hip. The opposing team’s crowd roared in laughter. Out of strength and humiliation, I needed to prove I was ok. Being the gymnast on the squad, I proceeded to run across the floor. I did flip after flip with a final jump into flying splits, landing in a perfect Tadasana! I walked away in massive pain, but I still had a smile on my face. I went to the doctor- no x-rays were taken. My doctor told me that I just pulled some muscles. My prescription was to rest for 2 weeks, with no activity, and then I could get back up and move on. That is exactly what I did. However, I never truly felt right. I continued to be athletic: doing yoga with my mother, cheerleading, and track. Then at 16, I began hitting the gym hard and training to possibly compete in fitness modeling competitions. Meanwhile, I always had a silent, nagging sensation in my right hip. It wasn’t until I had a back injury at 25 years old, when I was a flight attendant, that I really started experiencing pain. I learned through my back injury, I have two vertebrae below that have nerves which correlate into the hip area. I eventually developed intense sciatica and began to have some subtle groin pain. Through physical therapy, I recovered from the back injury but my hip pain continued… and so did my intense workout routines. I ignored the subconscious warning that something just wasn’t right. It was like I had to prove to myself that I was ok. That cheerleading fall really took a toll on my psyche and continued to live in my body until now. From the age of 28 until last year, I was in and out of a chiropractor for mid back, hip and SI pain. I received adjustments that would make me feel better for a couple of months at a time and then I would be back in the office with the same pain getting readjusted. Last year I got to the point that nothing was helping, not even my yoga practice anymore. As a Yoga Teacher, I began to be filled with so much self-doubt. I felt as though I was letting my students down because I couldn’t even practice much; I was in pain. To be completely honest, I began to feel like a fake because I dreaded getting on the mat. Every time I would demonstrate Warrior 2, Single-leg Pigeon, or other deep hip socket postures on the right side of my body, I would come out of the pose in massive pain but “sucked it up”. I silently berated my body with negative thoughts because it was so difficult to get into deeper postures. No one knew it though… I kept teaching and smiling, trying to prove to myself I could conquer my pain. It wasn’t until one morning that I could barely get up out of bed that I sought out a physical therapist. After 3 sessions, she sent me to a Sports Medicine doctor suspecting I had a Labrum Tear. My MRI proved I had a significant tear across the entire front part of my hip socket from 11 o’clock till 4 o’clock. Due to the pain the doctor suspected more to be wrong and that I could possibly be a candidate for hip replacement very soon if nothing was done. 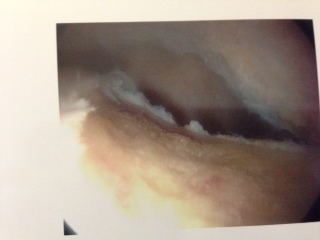 I chose the surgery in the hope that my Labrum was repairable. I was scheduled for surgery on August 1st , 2012. I was forewarned that the healing process could take 2 to 6 months or up to one year if there was a lot of damage. I instantly thought, “I’ll be the one to recover in 2 months!” Oh was I wrong. 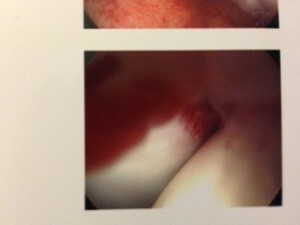 I had massive inflammation which my doctor said was quite bad, (red coloring in the picture below). Typically, a bright pink is associated with this type of damage, and when healthy, should be an off-white coloring. I had bone spurs on both the femur head and inside the acetabulum, (socket). These spurs kept rubbing every time I moved, basically cutting up the cartilage and the Labrum, (which is to act as a shield to the inner acetabulum). I was told I would be on crutches for 4 weeks- no weight at all on my right leg and no running for at least 6 months or longer. I was flooded with with emotion which lead me to pure frustration, fear, depression, and anger. I cried to myself. Why didn’t I listen to my soul or my body, and instead keep abusing it? People abuse other people, dogs, animals but how many of us abuse ourselves… I realized that is what I was doing all that time. I felt I had to prove something or be in awesome shape. I just wasn’t honoring my body. I certainly had not been practicing Ahimsa, non-violence. Through the years before my surgery, pain showed up in other areas of my body: my back, jaw, migraine headaches. I didn’t realize it until one morning last year, my husband asked me why I seemed to always wake up in a bad mood. I didn’t realize this. I began to focus on my mood over the next couple of mornings. I discovered that my attitude shift was due to the pain in my body. I was coping with it in order to teach classes and get through my daily routine. For years I learned to manage and wore a mask in order to live with the pain. I am now 6 months out of surgery. I am experience a new body, a new spirit and a new mindset. I wake up in a better mood with no more daily headaches either! I have learned more in the past 6 months than in the past 30 years of being physically active. The biggest and most important lesson I learned is to listen and surrender within. My fall 24 years ago created an unstable hip and muscular imbalance that led my body to compensate with different muscles which caused other pain. These muscles were bearing more weight than intended to. How often do you bear the weight for someone else? It can weigh you down over time, right? Our body is the same way. I am now practicing yoga again and I must say… what an exhilarating experience! I have made a couple of mistakes during my recovery due to impatience. This has set me back in healing, but leading me back to my lesson of patience. Now, Warrior 2, Pigeon, lunges, and balancing postures on my right side no longer feel pain! I have come to accept that I may and I may NOT be able to do certain fancy poses again. But you know what? It feels amazingly free to be “ok with it”. I practice with a sense of letting go instead of trying hard. It feels really damn good to feel free and not keep proving to anyone that I am fine. It’s ok to be vulnerable and fall down sometimes. This is why “patience” is my intention this year; patience to listen and balance completely with my inner world and outer world. I don’t have to prove I am perfect or that I can do the best cheer, jump, split, run, or yoga pose; all I want to be is ME! Striking Side Plank Tree pose, post surgery! Heather is a compassionate, intuitive, and patient Yoga Teacher and Doula. She enjoys all the classes she teaches, especially her Prenatal Yoga classes! Heather teaches in and around Atlanta. Connect with Heather at www.surrenderwithin.com. Thanks for sharing your story Heather. I found it to be inspiring for those of us who have suffered and pushed through pain of our own. Heather, thank you for sharing your story. I’m proud to be one of your students! Thank you so much! I love seeing your shiny face in class and must say how wonderful it is to see you blossom! Thank you Cheryl! I do feel lighter and sweeter and am loving everyday! Beautiful Heather. Thank you for sharing. Your honesty and openness is greatly appreciated. I did not go into great detail regarding a couple thoughts in my blog which I would like to highlight here. One I am in full support of Chiropractic care and recommend it! I have found a wonderful chiropractor here in Atlanta that is working with my current physical therapist in helping me in my recovery process, Dr. Laura Scheiner at http://www.naturallywellatlanta.com. I have several students who attend my classes who currently attend Life University for Chiropractic. Blair suspected my Labrum Tear and helped me PRE-Surgery. I see Melissa Marchetti at Back 2 Motion now POST-Surgery. Both therapists’ offices are in the same location and I highly recommend them both!! Thank you to all who have supported me and continue to through this journey! Thanks for sharing this, Heather! It hits SO close to home for me. I have an old hip injury from my teenage years as a ballet dancer. Over and over, I have powered through the pain until I would find myself debilitated. I absolutely hear you about how pain can affect your life, your mood, your personality–it doesn’t just affect a single body part. Thank you for your openness. I wish you healing and continued patience this year! Thank you for reading the post and I am glad this struck a chord for you. I believe in truly listening and honoring our temple (body) to the fullest! I am enjoying my new journey!